I buy a Lego seasonal Halloween building set every year for my nieces and nephews who are still interested in Lego. This year's is LEGO #40260. 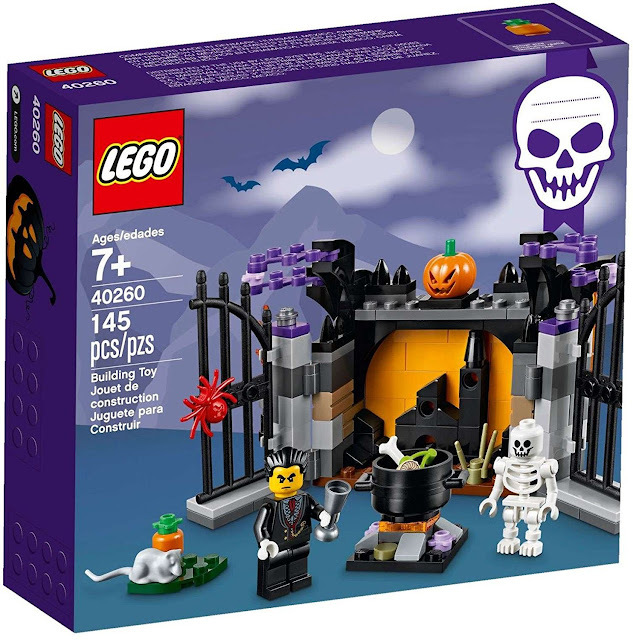 This 2017 Lego Halloween set contains 145 pieces. There's a fireplace with creepy black gates, a cauldron, a pumpkin, a rat, and fire. The two minifigures that come with the set are a vampire and a skeleton. Now we'll have something to entertain everyone while we wait the agonizing length of time between school letting out at 3:05 pm and trick-or-treating starting around 6pm!